Smiling gingerbread men deliver Christmas cheer. The tiles for this project were printed at approximately 1 1/2" square. After completing the tea bag folding, mount the medallion on a piece of green cardstock and cut around it leaving a 1/8" border. The gold embossed background was made by glueing giftwrap to lightweight carstock and then embossing it with the cuttlebug. Cut the embossed piece to 3 3/8" square and mat it on a 3 1/2" square piece of green carstock. Cut the remaining piece of embossed paper to 7/8" wide and mount it on 1" wide green cardstock. 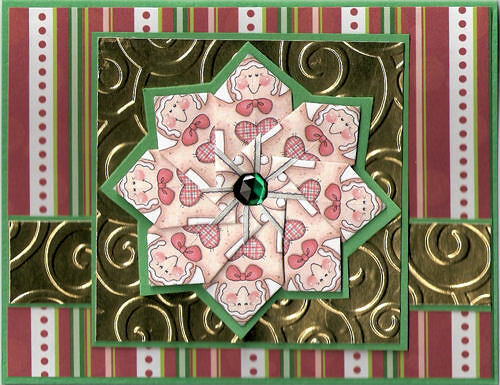 Cut the Christmas print background to 4 1/8" x 5 3/8" and glue it to the green card blank. Arrange the rest of the pieces as shown. Add a green rhinestone to the center of the tea bag medallion. Teabag folding instructions for star with open center. Green card blank 4.25" x 5.5"